It doesn't get much easier than this to create a mouth-watering breakfast treat. 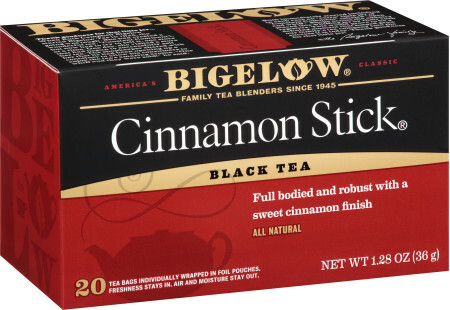 Let Bigelow Cinnamon Stick tea add the warm, cozy taste and smell to your winter morning. Combine tea bags and boiling water in heat-proof container. Steep for 10 minutes; squeeze tea bags and remove from liquid. Set aside. Preheat over to 350ºF. On a lightly floured surface, roll out crescent rolls into a 8"" x 11"" rectangle. Brush on ½ of the tea liquid to coat dough. Spread ½ cup of dark brown sugar on dough to evenly coat. Roll dough into large log shape. Cut into 8 evenly sized pieces. Place flat side up in a round cake pan. Bake 20-25 minutes. Remove from oven and allow to cool. To make icing: Use remaining ½ of tea liquid, whisk in butter and confectioners sugar (add sugar slowly and whisk while adding). Pour icing over cooled sticky buns. Leave sticky buns in pan until icing begins to harden, approximately 5-8 minutes. Remove sticky buns from pan and place on serving plate.